Play Guitar With Suede PDF + Mp3 CD download. 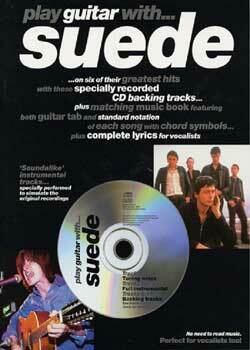 Play guitar on six of Suede’s greatest hits with these specially recorded CD backing tracks plus matching music book. The music book features both guitar tab and standard notation of each song, plus complete lyrics. The CD contains two specially recorded backing tracks of each song. The first is a full demo with guitar, showing you how it should sound, and a backing for vocals. The second is a backing track without guitar for you to play along with on your guitar. Both versions are without vocals and have instrumental cues so you can sing along too, with or without guitar. Download Play Guitar With Suede PDF free and other books from our site. Only high quality PDF scans. Please write a review, it's important for our community.